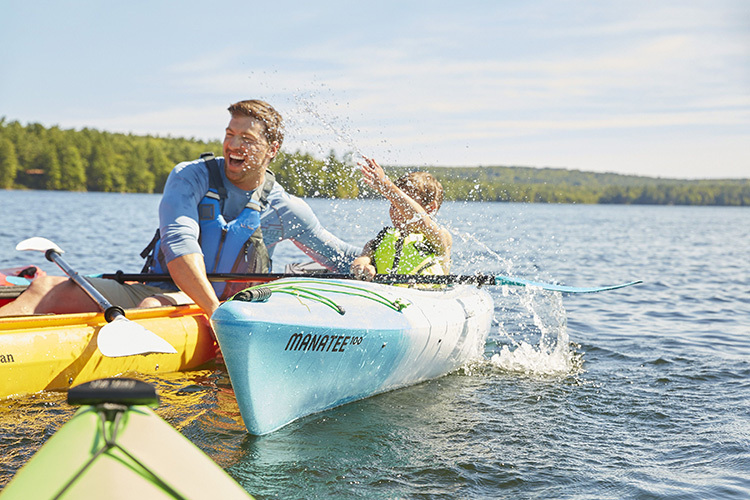 Whether you choose a canoe, kayak, raft or paddleboard, getting out on the water with your kids is a great way to make memories this summer. Whether you head out for a day across the bay or a jaunt into the wilds for a week-long adventure, paddling is one of the best outdoor activities you can do with your kids. Add water to your children’s upbringing and they’ll remember it when they’re well down the river of life on their own. But there are some basics to consider before getting your feet wet to ensure everybody has a great time and wants to go again. 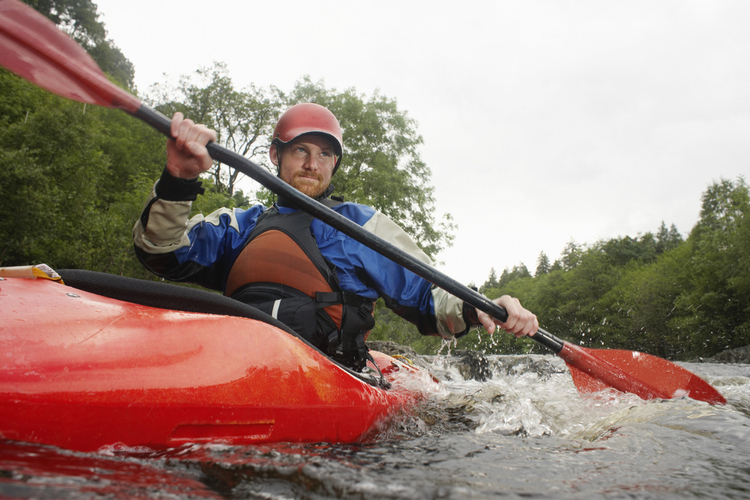 The following are a few pointers on everything from paddlecraft to proper safety. 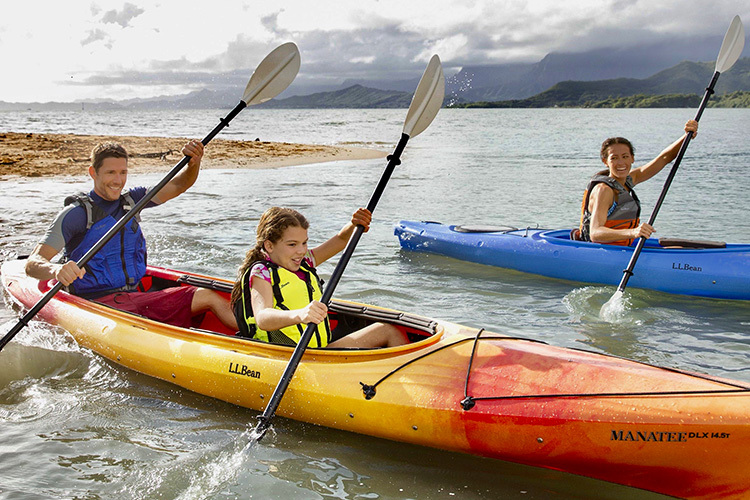 Paddling with kids is easy, but you always want to play it safe. Start by making sure everyone is wearing a proper flotation device for their size and weight. The number one rule when paddling with kids is to make sure you and your child wear a properly fitted life jacket at all times on the water. Today’s Coast Guard-approved Type III life jackets are more comfortable than ever, and there’s no excuse not to wear one. Stay close to shore until you’re comfortable with self-rescue techniques, and always tell someone where you’re going and when you expect to return. There are as many crafts to choose from as there are birthday presents at a toy store. Those living in the mountains often take to waterways and lakes in rafts, canoes and inflatable kayaks. 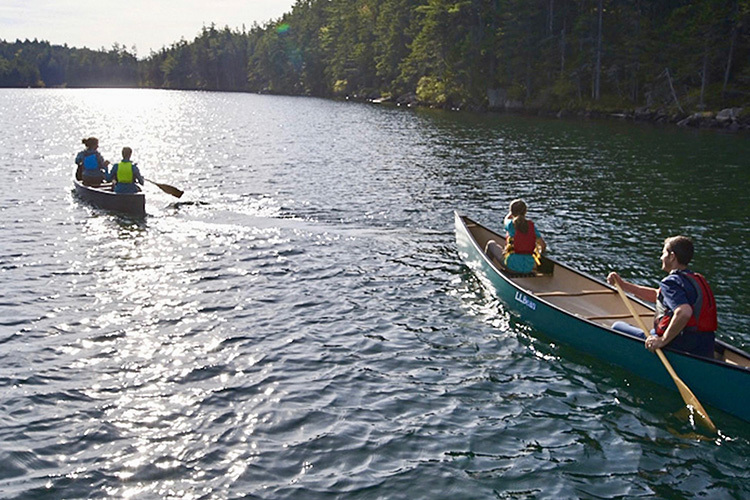 In the Midwest and along the coasts, families break out canoes, sea kayaks and rec kayaks. Even taking the family rowboat out on Golden Pond or inner-tubing a slow-moving creek instills the magic of water. Following is a quick rundown on popular paddlecraft to consider. 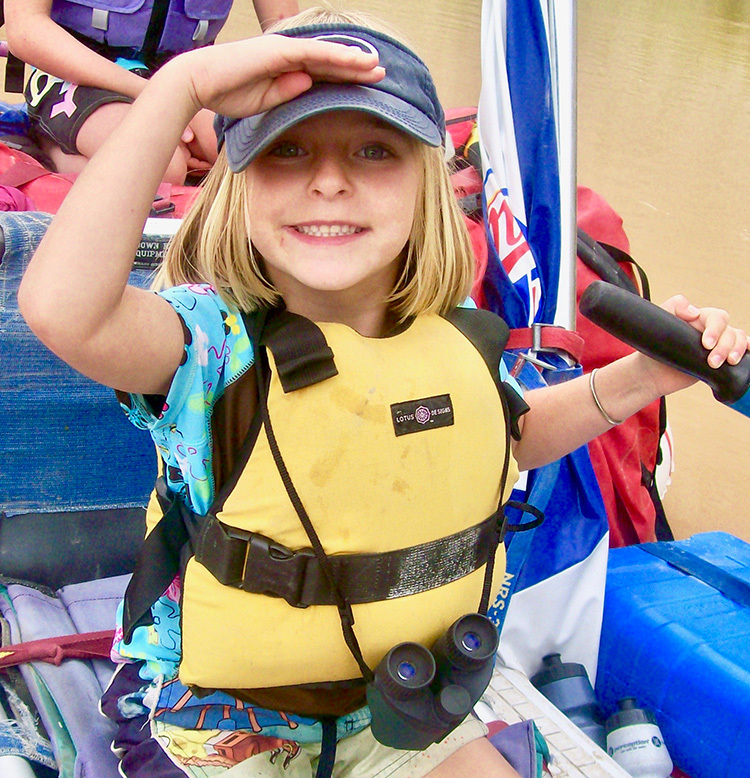 Giving a child their own pair of binoculars to watch wildlife along the way is a great way to keep kids engaged. Inflatable kayaks, or duckies, are the perfect family craft for mellow river or lake use. And the merganser moniker is an apt analogy. You bob around on the water propelled by web-like paddles, conjuring images of the rubber duckies floating with Ernie in a bathtub. The nickname alone should make your kids start putting their swimsuits on. Nomenclature aside, they’re perfect for introducing your young-uns to paddling. In the first place, they’re not fragile like that heirloom canoe. They’re made of rubber or PVC, just like most indestructible toys. They also bounce off things rather than go “thunk.” But their best attribute comes in how they handle. They have wide enough bottoms — like us parents get — to make them stable; are narrow enough to keep them maneuverable; and have enough hull speed to get you back to shore for snack time. 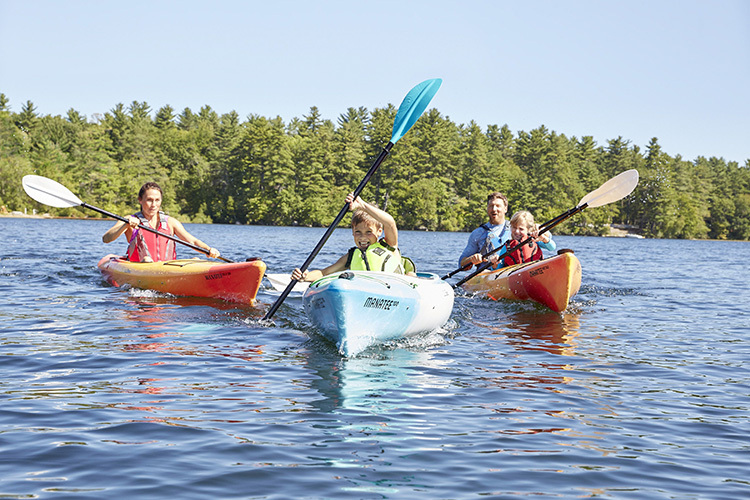 All this creates a versatile craft that gives your kids a more intimate connection with the water than a raft, yet a more stable one than a traditional kayak or even a canoe. 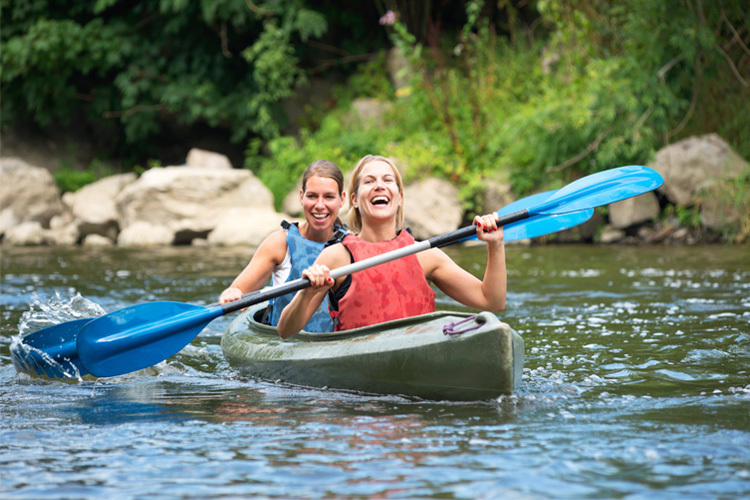 Quick Tip: In event of a capsize, stay calm, make sure everyone is accounted for, and either climb back on your craft (if it’s a sit-on-top, standup paddleboard or inflatable kayak); or get help righting it (ideally you should always head out in pairs). They also have advantages off the water. When you’re through, simply deflate and roll for easy storage back home—which you most definitely need, now that your garage is littered with mounds of kid gear. Your kids can even get involved in the deflating process, sitting on the tubes to errant fart sounds emanating from the valves. Canoes are stable, and the sides are steep enough to keep kids in the boat. Lighter paddlers should sit in the bow seat. Canoes have a major advantage over inflatable kayaks and rafts: you don’t need to inflate them. Simply pop it off your car, throw it in the water, and play Lewis and Clark on your local lake. For younger kids, they even offer playpen-like walls to keep your brood in the boat. These same sidewalls also give them grocery cart-like carrying capacity. Even a simple 16-footer can fit a family of four, as well as Rover the dog. I can vouch for the craft’s family practicality. Our perfect family craft manifests itself as a 16-foot, Royalex Old Town Osprey, as forest green as our canoeing skills. When we first got it, it was big enough to fit 3-year-old Brooke five times end-to-end, with room left over for newborn Casey, and our dog, Java. At first, Casey was affectionately known as a “bow baby,” riding shotgun and inevitably falling asleep. Eventually, your child will graduate to the middle, where she falls under the stern paddler’s jurisdiction, and become a midships munchkin. Now, she’s part of the team, especially if you outfit her with her own pint-sized paddle. Once your kids actually start paddling, they might want to move back to the bow. When this happens, and there’s just one grown-up along, turn the boat backwards and place your child up front and you in the rear to give the canoe better trim. When your kids get old enough, the last transition is to turn the canoe back around and paddle it normally, taking turns between bow and stern. But this configuration is also short-lived; by the time most kids are big enough for this, they’ll want nothing to do with mom and dad -- they’ll want a boat of their own. 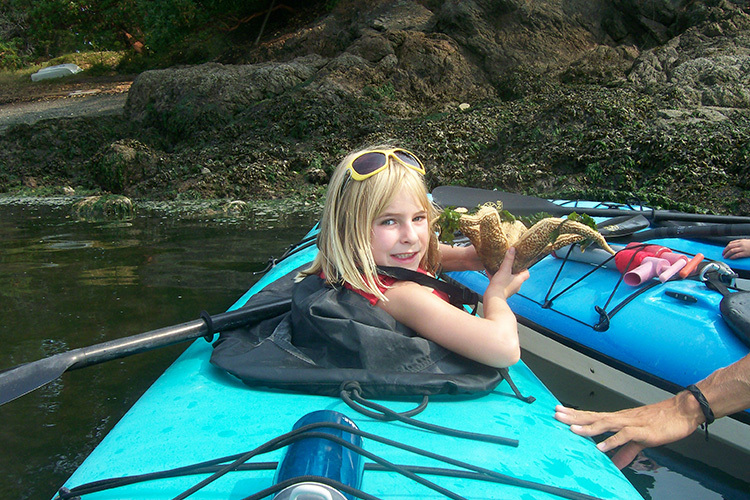 The author’s daughter discovered her first starfish on a sea kayaking adventure. Note how her sea kayak has a nylon spray skirt to keep her from getting splashed. Brooke was giddy all morning. She was only 4 and we were heading out for a sea kayaking tour of British Columbia’s Barkley Sound. I put her up front in a double, a nylon spray skirt with suspenders rainbowing over her life jacket to keep splashes at bay. No sooner than we put in and she started singing, “Down by the bay, where the watermelons grow,” a Raffi favorite. Unlike canoes, sea kayaks are easily propelled by one person, and put your lower half out of the wind and rain. 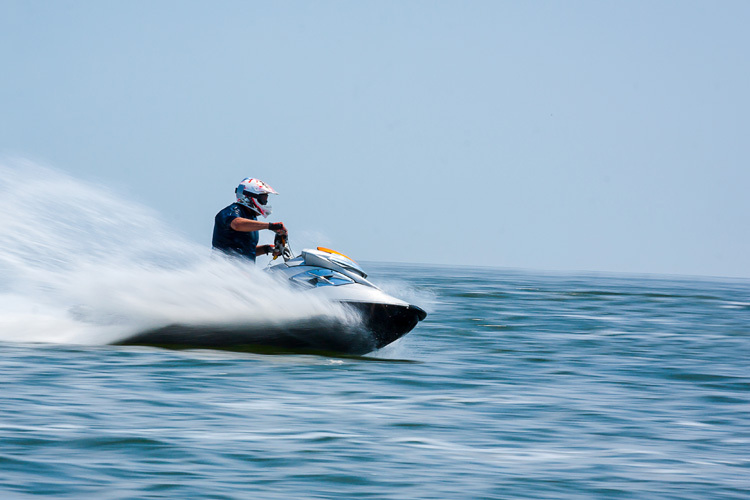 Plastic boats are tougher, heavier and less expensive, while fiberglass is lighter and faster, but more fragile and expensive. Tandems work best for younger kids. You can man the stern, putting your child in the bow. Quick Tip: Until your kids are capable swimmers, stay close to shore instead of heading out on the high seas. Also, make sure your craft has bulkheads or float bags, and that you have a rescue plan should things go awry. Some parents store gear in front of children’s feet, so they won’t slide under the deck; others use a drybag or pad as a booster seat. The added height helps their paddles clear the cockpit rim for paddling. Speaking of which, don’t get a paddle sized for Yao Ming. Get a small one, and teach proper paddling technique by having their hands shoulder width apart (a lot of kids put them too close together), and rotate the torso with each stroke. Then rotate sea kayaking into your list of family friendly activities. Finally, make sure you bring along plenty of water and snacks to keep everybody well hydrated and fed. 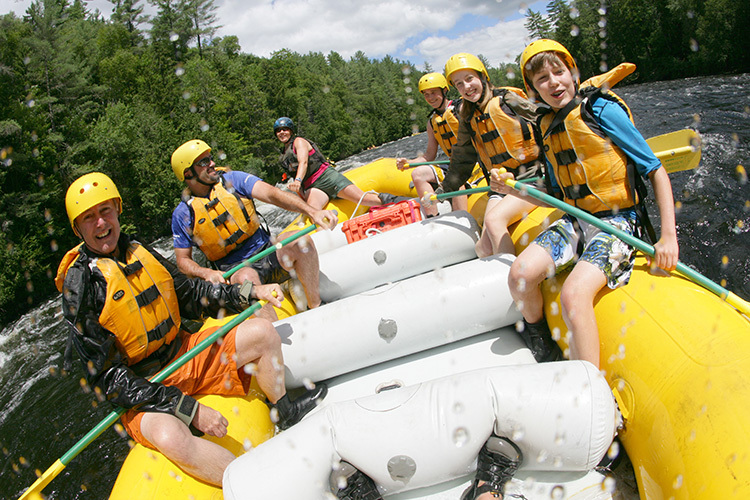 Getting dad wet is all part of the fun when you paddle with the family. Open cockpit rec kayaks, like these, are easy to get in and out of. Rarely will you find a better craft for getting your kids out on the water than rec kayaks, whose wide, flat bottoms make them stable enough for even the most torrential tantrum. Think of them like a sea kayak with training wheels. They’re so stable your grandmother could hop in one and paddle away. Like kids themselves, they come in a variety of styles and sizes. Two types work best: sit-on-tops, where you and your child sit on top of a depression in the kayak’s hull; and rec kayaks, which have large, open-cockpits for ease of entry and exit. Without claustrophobic cockpits to cram into, both let you and your kids paddle away on the first try without fear of tipping, and both are perfect for paddling as a family, whether your child is still in Pampers or on her way to a Ph.D.
Quick Tip: To keep everyone comfortable, wear clothing suitable for the conditions and weather, bring plenty of water, and slap on the sunscreen (UV rays reflect off the water). In warmer climates, sit-on-tops make the perfect choice. Your bodies are out in the open, and your child can even jump in the water to cool off and climb back aboard. Self-bailing holes near the seat keep the water out, and in the rare event of a capsize, you can simply flip it over and climb back aboard—just like climbing back on a bike. Rec kayaks have the same wide, stable bottom, but come with an enlarged cockpit. This keeps you and your brood out of the elements, and water from puddling around your derriere. Most single-cockpit rec kayaks are big enough for you and your child, and some come with cockpits so large they can fit your mother-in-law as well (though that might be too close for comfort). When your kids get older, position them in the front of a two-person craft while you steer from the stern. Rec kayaks have the same wide, stable bottom, but come with an enlarged cockpit. This keeps you and your brood out of the elements, and water from puddling around your derriere. Most single-cockpit rec kayaks are big enough for you and your child, and some come with cockpits so large they can fit your mother-in-law as well (though that might be too close for comfort). When your kids get older, position them in the front of a two-person craft while you steer from the stern. The learning curve for each is akin to riding a tricycle. There’s no leaning, and most importantly, no rolling. 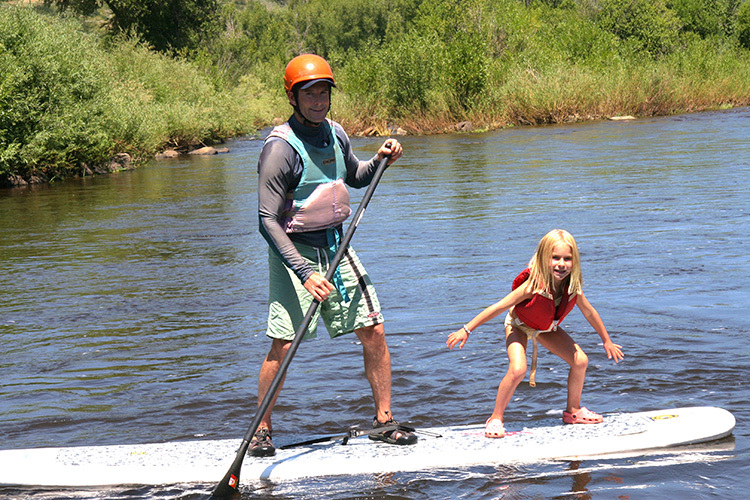 Simply hop on and go to get your children’s feet wet in the world of paddling. If you need a little nudge to keep everyone occupied, try one of these classic games. Paddleboards add a whole new dimension of fun. And they are the easiest for kids to jump off and climb back onto. 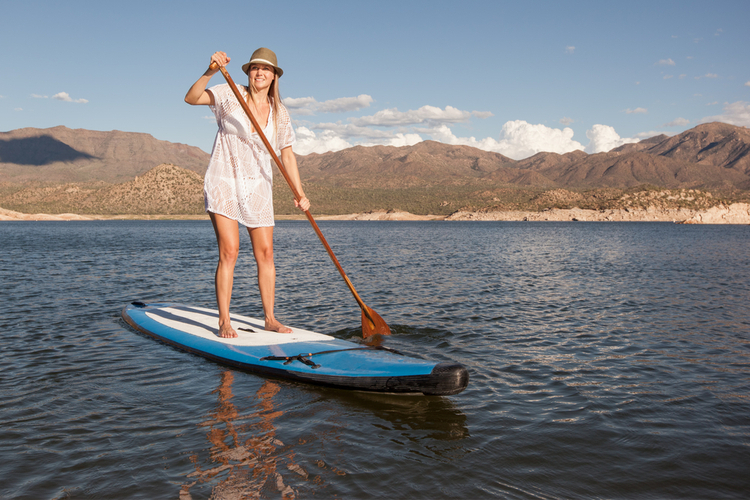 Paddleboards are a sort of extra-buoyant surfboard that you paddle standing up with an elongated paddle. This makes them the kid equivalent of a paddle-able, floating dock. Of all paddlecraft, they’re the easiest to cannonball off of and climb back on, and are the most conducive to massive, water-plunging games of King of the Hill. They’re also easy to paddle tandem when your kids are younger. I became sold on them when camping with my family on Colorado’s mist-covered Pearl Lake. We’d brought every craft under the sun -- a canoe, sea kayak, inflatable kayak, rec kayak, even a kid’s kayak. But they all looked on with envy as the paddleboard commanded the kids’ affection. They were on it—or rather, on it and off it—eight hours a day, while the other boats barely got wet. We had to chide them back to shore for dinner. Born as a Hawaiian surf tool, they’ve become the quintessential family craft, suitable for lakes, oceans and even mild river travel. Sure, they require a modicum of balance (you’ll feel like a toddler taking his first steps the first time you try one). But once your kids try it, be prepared for homework to take the back burner. Casey and I even used one to surf the Yampa River through town, her playing Kelly Slater up front while I steered from the stern. If the going ever got rough, she’d simply jump down to all fours and then pop back up once the river settled down. We even received applause from diners on the riverside deck of the Yacht Club restaurant as we surfed by. Hire an Outfitter or Go It Alone? No matter what kind of paddling adventure you choose, the author recommends taking a guided adventure your first time out. There are two ways to get your feet wet with a family outing on the water: either John Wesley Powell it yourself or go with an outfitter. For those unfamiliar with paddling, I highly recommend that you go with an outfitter your first time out. They have the gear and skills to ensure your indoctrination doesn’t become an “indunktrination." Unsure? Take an outfitted trip first and then play Huck Finn. Better safe than soggy. Either way, realize that paddling with your kids is a way to come together on a medium that’s responsible for all life itself—which means it’s bound to help your family life as well. About The Author: The 14-year editor-in-chief of Paddler magazine and founder of www.paddlinglife.net, Eugene Buchanan has written about the outdoors for more than 25 years, from covering the X Games for ESPN.com to working for NBC at the Beijing Olympics. With freelance articles published in the New York Times, Men's Journal, Sports Afield, Outside, National Geographic Adventure and more, he’s a member of New York's Explorer's Club and the author of five books, including Brothers on the Bashkaus, Comrades on the Colca and the recently released Tales from a Mountain Town. Learn more at www.eugenebuchanan.com.